Does not leak when stored horizontally. TETRA Pak has made the SlimCap available on its Tetra Brik Aseptic 1.5L Slim. The 1.5L container is used for iced teas, wine, fruit juices from concentrate and nectars. SlimCap can be resealed after opening and does not leak when stored horizontally. The user unscrews the cap, breaking the two plastic bridges that act as tamper evidence. 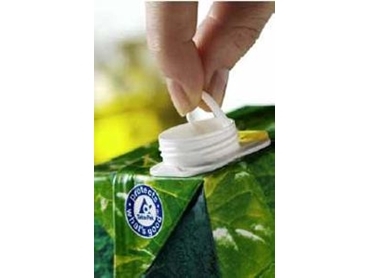 The user then pulls the plastic ring which in turn gently tears open the PullTab. SlimCap is available in a variety of colours.